UNITED NATIONS, April 28 -- The UN's Ban Ki-moon's envoy to Ivory Coast, Choi Young-jin, gave a decidedly upbeat report Tuesday even as the Forces Nouvelles rebels threaten to pull out of the peace process if President Laurent Gbagbo doesn't finally hold the country's promised election before the end of 2009. Stopping outside the Security Council where Inner City Press waited to ask questions, Choi acknowledged disappointment caused by the switch in temporal order under the “Ouaga IV” agreement, now putting unification before the holding of the election. But he pointed out that Cote d'Ivoire has a security force of 40,000, backed by an annual $200 million of a budget of $5 billion. If the governments of Liberia or the Democratic Republic of the Congo had similar security forces, he said, the UN could be preparing to leave those countries. But it cannot leave Cote d'Ivoire until unification has happened, he added. Choi's counterparts in Liberia and DRC, Ms. Loj and Alan Doss, might find this analysis surprising. In Congo, for example, the FDLR rebels are back on the rampages, as is the Congolese Army. Choi of course is better plugged in, on the UN's 38th floor at least. Inner City Press asked Choi about what a Security Council Ambassador who was on the June 2008 Council Africa trip to Abijan said, that Gbagbo told him that France said that as long a French company was chosen and paid for the technical work of the election, the timing of voting didn't matter so much. 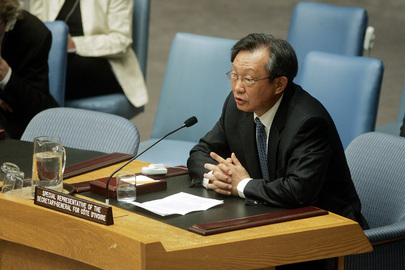 Choi protested, but the fact remains that a Security Council Ambassador said it. Inner City Press asked for an update on the Moroccan UN peacekeepers sent home for investigation and discipline after being charged with sexual abuse and exploitation in Ivory Coast. Choi said that all had gone well, Morocco is getting training. But what about discipline and accountability? Inner City Press e-mailed a request early Tuesday after noon to the Department of Peacekeeping Operations for simply information on the outcome of the repatriations to Morocco from Cote d'Ivoire, and to Sri Lanka from Haiti. But despite confirmation of receipt, 12 hours later no information had been provided. When it is, it will be reported here. Footnote: the Security Council's upcoming Africa trip, presided over by Russia because it is its month with the Council's presidency, will now bypass not only Sudan but also Dungu in the Congo. Inner City Press joked with a Russian diplomat that perhaps the Lord's Resistance Army would arrange to meet and brief the Council elsewhere at the Council members' convenience. Russia is much more focused on its May 11 meeting about the Middle East, to which neither the U.S. nor China have yet said who they'll send. If it's not Hillary, the Quartet cannot meet. And since Russia does not want to invite the new Israeli foreign minister, Arab ministers won't be able to come. What kind of meeting will it be? Watch this site.